This article is about the city. For the airport, see Seattle–Tacoma International Airport. For other uses, see SeaTac. SeaTac /ˈsiːtæk/ is a city in southern King County, Washington, United States, and an inner-ring suburb of Seattle, Washington. The name SeaTac is a portmanteau of Seattle and Tacoma, and is derived from the Seattle–Tacoma International Airport. The city of SeaTac is 10 square miles (26 km2) in area and has a population of 26,909 according to the 2010 census. The city boundaries surround the Seattle–Tacoma International Airport (approximately 3 square miles (7.8 km2) in area), which is owned and operated by the Port of Seattle. The city includes the communities of Angle Lake, Bow Lake, McMicken Heights and Riverton Heights, which were established before the city's incorporation. Residents voted for incorporation on March 14, 1989, and the city incorporated in February 1990. The Highline area, which includes modern-day SeaTac, Burien, Tukwila, and Des Moines, was settled by Americans in the mid-1850s. The federal government finished construction of a military road from Fort Steilacoom to Fort Bellingham in 1860, passing through the Highline area to the east of modern-day SeaTac. Local residents voted for incorporation on March 14, 1989, and the city incorporated on February 28, 1990. In 2014, Gavin Kelly of The Resolution Foundation wrote that "A generation ago SeaTac was what Americans would call a middle-class town. A jet-fueller or baggage handler could earn a decent living." SeaTac is governed by a city council which consists of seven elected councilpersons. The city "has contracted with the King County Sheriff's Office for law enforcement since incorporation in 1990." Deputies assigned to SeaTac wear city uniforms and drive patrol cars marked with the city logo. There are currently 51 patrol officers, detectives, and support staff assigned full-time to the city. In January 2014 the SeaTac Fire Department entered a 20-year contract with Kent Fire Department Regional Fire Authority (RFA). SeaTac's three fire stations, Station 45, 46, and 47, joined Kent's Station 73 to make up RFA's West Battalion. The Seatac Municipal Court, located in the City Hall, is a court of limited jurisdiction. The judge is authorized by the Revised Code of Washington to preside over civil infractions, traffic infractions, criminal misdemeanor and gross misdemeanor violations, and civil orders for protection. Public Works is responsible for planning, design, construction and maintenance of streets, transportation improvements, surface water utility, and solid waste and recycling programs. In 2013, voters in the city narrowly passed a minimum wage of $15 per hour for employees of airport-related businesses, such as hotels, parking lots and car rental agencies. In a later appeals court decision, the $15 minimum wage was reversed for employees working entirely on Port of Seattle property within the city limits but still applies to employees of airport-related businesses in the city proper. Union workshops are exempt from the $15 minimum wage. However, the Washington Supreme Court in August 2015 reversed the King County Superior Court ruling, which said that SeaTac did not have authority to set a minimum wage at the airport. The Supreme Court rejected the argument that the wage did not apply because the airport is owned by the Port of Seattle. The Court stated that Proposition 1 can be enforced at Seattle–Tacoma International Airport because there is no indication that it will interfere with airport operations and that federal labor law does not preempt the provision protecting workers from retaliation. The Riverton Heights Post Office is located in the city. The National Transportation Safety Board operates the Seattle Aviation Field Office in the city. The Federal Bureau of Prisons operates the Federal Detention Center, SeaTac in SeaTac. The city is home to over 900 licensed businesses, nearly 80 of which are Fortune 1000 companies. They employ nearly 40,000 employees in the city of SeaTac and generate local sales of approximately $3.7 billion. Alaska Airlines and Horizon Air are headquartered in the city. Four airlines have operations at 18000 Pacific Highway South (also known as 18000 International Boulevard) in the city, including Asiana Airlines, EVA Air, Hainan Airlines, and China Airlines. SeaTac’s Department of Community and Economic Development was formed in early 2011 to create a one-stop permitting center, increase the level of service and assist in the facilitation of economic development by creating a more cohesive approach to real estate development and job creation. The new department has four divisions: Economic Development, Planning, Engineering Review, and Building Services. In 2013, the City of SeaTac Proposition No. 1 passed with 50.64% of the vote to raise the minimum wage to $15 per hour. SeaTac is located at 47°26′29″N 122°17′35″W﻿ / ﻿47.44139°N 122.29306°W﻿ / 47.44139; -122.29306 (47.441406, -122.293077). According to the United States Census Bureau, the city has a total area of 10.21 square miles (26.44 km2), of which, 10.03 square miles (25.98 km2) is land and 0.18 square miles (0.47 km2) is water. As of 2000 the median income for a household in the city was $41,202, and the median income for a family was $47,630. Males had a median income of $34,396 versus $28,984 for females. The per capita income for the city was $19,717. About 9.8% of families and 11.5% of the population were below the poverty line, including 15.5% of those under age 18 and 8.1% of those age 65 or over. The most commonly spoken foreign languages in SeaTac are, in order, Spanish, Somali, and Punjabi. As of the census of 2010, there were 26,909 people, 9,533 households, and 5,913 families residing in the city. The population density was 2,682.9 inhabitants per square mile (1,035.9/km2). There were 10,360 housing units at an average density of 1,032.9 per square mile (398.8/km2). The racial makeup of the city was 45.9% White (39.5% Non-Hispanic White), 16.8% African American, 1.5% Native American, 14.5% Asian, 3.6% Pacific Islander, 11.6% from other races, and 6.0% from two or more races. Hispanic or Latino of any race were 20.3% of the population. There were 9,533 households of which 33.2% had children under the age of 18 living with them, 40.6% were married couples living together, 14.0% had a female householder with no husband present, 7.4% had a male householder with no wife present, and 38.0% were non-families. 28.8% of all households were made up of individuals and 7.5% had someone living alone who was 65 years of age or older. The average household size was 2.72 and the average family size was 3.38. The median age in the city was 34.5 years. 23.1% of residents were under the age of 18; 10.3% were between the ages of 18 and 24; 31.8% were from 25 to 44; 25.2% were from 45 to 64; and 9.7% were 65 years of age or older. The gender makeup of the city was 52.4% male and 47.6% female. Highline Public Schools operates the city's public schools. Elementary schools serving sections of the city include Bow Lake Elementary School in SeaTac, Madrona Elementary School in SeaTac, McMicken Heights Elementary School in SeaTac, and Cedarhurst Elementary School in Burien. Most residents are zoned to Chinook Middle School and Tyee Educational Complex in the city, while some are zoned to Sylvester Middle School and Highline High School in Burien. Tyee Educational Complex housing three independent schools: The Academy of Citizenship and Empowerment, and Odyssey: The Essential School. has been transformed back to Tyee High School - a single school in the 2017-18 school year. In 2004, Highline Public Schools reorganized some of its high schools, including Tyee, into having smaller programs on larger campuses. The King County Library System operates the Valley View Library in SeaTac. The city operates seven city parks and operates two community center facilities. Angle Lake Park, a 10.5-acre (42,000 m2) park at Angle Lake, has a barbecue area, a boat launch, a fishing pier, playground equipment, an open recreation area, swimming facilities, a stage, toilet facilities, and a spray park. In the swimming area lifeguards are on duty during the summer months. Bow Lake Park, a 4-acre (16,000 m2) park, consists of open space. Des Moines Creek Trail Park, consisting of 96 acres (390,000 m2), has a paved trail for bicyclists and pedestrians; off-street parking spaces are located at the trail head. The 37-acre (150,000 m2) Grandview Park, an off leash dog area, has open areas, benches, fencing, a kiosk, waste receptacles, "sani-cans," and trails. The 2.5-acre (10,000 m2) McMicken Heights Park has an open area, playground equipment, and tennis courts. The Neighborhood Park at SeaTac Community Center has a half court basketball court a skate park, playground equipment, a picnic area, a climbing boulder, and parking. The 165-acre (0.67 km2) North SeaTac Park has the SeaTac Community Center, baseball, soccer (football), and softball fields, a disk golf course, an outdoor basketball court, an open area, playground equipment, a picnic shelter, toilet facilities, BMX track and paved walking trails. The 18-acre (73,000 m2) Sunset Park has baseball/softball fields, soccer fields, tennis courts, toilet facilities, and paved walking trails. The 21-acre (85,000 m2) Valley Ridge Park has baseball/softball fields with synthetic turf, outdoor basketball courts, a community center, a hockey court, playground equipment, a skate park, soccer fields with synthetic turf, tennis courts, toilet facilities. The Tyee Valley Golf Course is an 18-hole golf course and also served as the 1988 and 1989 USA Cross Country Championships running course. SeaTac is served by three major highways: State Route 99 (International Boulevard), State Route 518, and the Airport Expressway. Portions of Interstate 5 and State Route 509 also lie within the city limits. The city is served by the Seattle–Tacoma International Airport, located within city limits. The city is also served by several public transportation services: Link Light Rail stops at two stations in the city, at SeaTac/Airport station and Angle Lake station; King County Metro operates several bus routes in the area, including the RapidRide A Line on International Boulevard and RapidRide F Line on Southcenter Boulevard; some Sound Transit Express regional bus routes terminate or serve the SeaTac area, primarily the airport and other transit hubs. ^ "2017 U.S. Gazetteer Files". United States Census Bureau. Retrieved March 28, 2019. ^ a b "American FactFinder". United States Census Bureau. Retrieved December 30, 2014. ^ "SeaTac". Geographic Names Information System. United States Geological Survey. ^ "SeaTac History". History Link. Retrieved December 30, 2014. ^ "Welcome to the City of SeaTac 'The Hospitality City'". City of SeaTac. Retrieved December 30, 2014. ^ Dorpat, Paul; Crowley, Walt (May 31, 2003). "SeaTac — Thumbnail History". HistoryLink. Retrieved February 17, 2018. ^ Wilma, David (March 15, 2006). "City of SeaTac incorporates on February 28, 1990". HistoryLink. Retrieved February 17, 2018. ^ a b Kelly, Gavin. "SeaTac: the small US town that sparked a new movement against low wages." The Guardian (The Observer). Saturday February 22, 2014. Retrieved on February 24, 2014. ^ "King County Sheriff". King County. Retrieved December 30, 2014. ^ "Our Department". City of SeaTac. Retrieved December 30, 2014. ^ "SeaTac Fire joins Kent Fire RFA". City of SeaTac. Retrieved December 30, 2014. ^ "History". Kent, WA Fire Department Regional Fire Authority. Retrieved December 30, 2014. ^ "Stations & Facilities". Kent, WA Fire Department Regional Fire Authority. Retrieved December 30, 2014. ^ "Municipal Court". City of SeaTac. Retrieved December 30, 2014. ^ "Public Works". City of SeaTac. Retrieved December 30, 2014. ^ "State Supreme Court rules: Sea-Tac's $15-an-hour minimum wage applies to airport workers". seattlepi.com. 20 August 2015. ^ "Post Office Location – Riverton Heights". United States Postal Service. Retrieved December 30, 2014. ^ "Regional Offices: Aviation". National Transportation Safety Board. Archived from the original on January 15, 2010. Retrieved May 15, 2010. ^ "FDC SeaTac Contact Information". Federal Bureau of Prisons. Retrieved December 30, 2014. ^ "Welcome to the city of seatac". City of SeaTac. 2008. Archived from the original on January 8, 2015. Retrieved December 30, 2014. ^ a b "Top Industries". City of SeaTac. Archived from the original on October 11, 2014. Retrieved December 30, 2014. ^ "Media Contacts". Alaska Airlines. ^ "Contact Information". Asiana Airlines. Retrieved December 30, 2014. – Although the address says Seattle, a search using Google Earth or Yahoo Maps will reveal that the headquarters are in SeaTac. ^ "Contact Phone Numbers". Alaska Air Group. December 1, 1998. Archived from the original on March 12, 2004. Retrieved July 23, 2009. ^ "Contact Us". EVA Air. Retrieved December 30, 2014. ^ "Contact Us". Hainan Airlines. Retrieved December 30, 2014. ^ 北美洲地區 [North America] (in Chinese). China Airlines. Archived from the original on December 17, 2014. Retrieved December 30, 2014. ^ "Results Detail - Mobile - King County Elections - King County Elections". kingcounty.gov. ^ "US fast-food workers stage nationwide strike". BBC News. 5 December 2013. Retrieved December 30, 2014. ^ "US Gazetteer files 2010". United States Census Bureau. Retrieved December 30, 2014. ^ "Census of Population and Housing (1790—2010)". U.S. Census Bureau. Retrieved December 30, 2014. ^ 1990 census figure enumerated prior to incorporation as SeaTac CDP. ^ Most of the census area returned under the name Valley Ridge in 1980. ^ "Population Estimates". United States Census Bureau. Archived from the original on October 19, 2016. Retrieved June 17, 2016. ^ "Diversity". City of SeaTac. 2008. Retrieved December 30, 2014. ^ "Bow Lake Elementary". Highline Public Schools. Retrieved December 30, 2014. 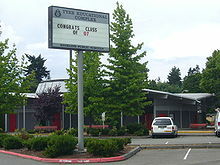 ^ "Madrona Elementary". Highline Public Schools. Retrieved December 30, 2014. ^ "McMicken Heights Elementary". Highline Public Schools. Retrieved December 30, 2014. ^ "Cedarhurst Elementary". Highline Public Schools. Retrieved December 30, 2014. ^ Elementary Service Area Boundaries (PDF) (Map). Highline Public Schools. Retrieved December 30, 2014. ^ "Chinook Middle School". Highline Public Schools. Retrieved December 30, 2014. ^ Secondary School Service Area Boundaries (PDF) (Map). Highline Public Schools. Retrieved December 30, 2014. ^ "Tyee Educational Complex". Highline Public Schools. Retrieved December 30, 2014. ^ "Global Connections High School". Highline Public Schools. Retrieved December 30, 2014. ^ "Odyssey: The Essential School". Highline Public Schools. Archived from the original on February 17, 2009. Retrieved April 14, 2009. ^ "High School Redesign" (PDF). Highline Public Schools. Retrieved December 30, 2014. ^ "Valley View Library". King County Library System. Retrieved December 30, 2014. ^ "Parks & Recreation". City of SeaTac. Retrieved December 30, 2014. ^ a b c d e f g h i j "Parks & Facilities". City of SeaTac. Retrieved December 30, 2014. ^ a b c d e f g h "Entertainment and Recreation | City of SeaTac". www.ci.seatac.wa.us. Retrieved 2017-10-04. ^ "USA Winter Cross Country National Championships". pntf.org. Retrieved 2018-09-08. ^ a b City of SeaTac Street Map (PDF) (Map). Cartography by NAVTEQ. City of SeaTac. October 23, 2013. Retrieved January 29, 2016. ^ "RapidRide A Line". King County Metro. Retrieved January 29, 2016. ^ "RapidRide F Line". King County Metro. Retrieved January 29, 2016. ^ Metro Transit System: Southwest Area (PDF) (Map). King County Metro. September 2015. Retrieved January 29, 2016. ^ "Transit". City of SeaTac. Retrieved January 29, 2016. Wikimedia Commons has media related to SeaTac, Washington. "City of SeaTac Economic Development". This page was last edited on 8 April 2019, at 16:47 (UTC).